I really like the ad unit Yahoo! started last year on their Yahoo! Mail website where a company can purchase the entire login page's background. 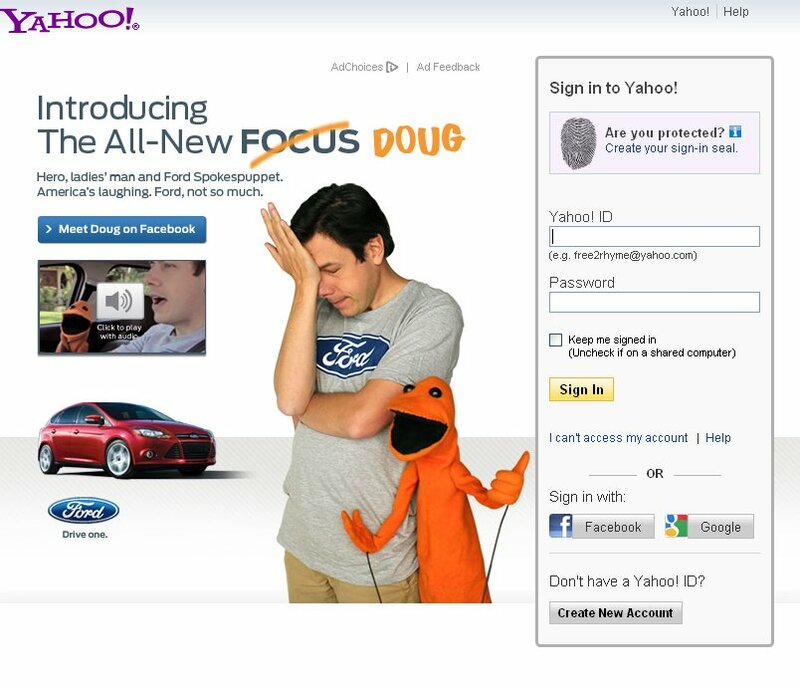 It has a crisp, generous look and the ad never gets lost in the typical clutter of ad banners, typical of other Yahoo! web properties. Today Ford decided to run a full page unit for the Ford Focus. Or did they? It seems like that was the plan until someone, or is it some thing, decided to takeover the promoting of the all-new Ford Focus. That "thing" if you haven't heard of it by now is Doug, Ford's Spokespuppet. And yes, "spokespuppet" is not a real word; instead, it is a whole new concept in automotive marketing lingo. Doug and his human sidekick John are bringing some humorous snark to the launch of the Focus. It's almost a little sad that the focus (pun intended) here is an orange puppet when Ford has an amazing new re-introduction of the Focus, having finally brought over to the States the European model that many have been asking for for years. Ford's ad unit brought significant awareness not to the car (well indirectly it did), but to a puppet. All of the calls-to-action for the ad unit go to Doug's Facebook Fan page where one can "Like me. Love was not an option." Not one link goes to the Ford Focus website to learn about the car. It's an interesting decision and perhaps a wise one as one website put it, "Ford Profit Fueled in Part by Social Media". I can't think of any situation in the almost 4 years I've been writing this blog where a major ad buy from a car company drove entirely to a puppet on Facebook. Sorry, "spokespuppet." I actually saw this tonight when I logged into Yahoo. Ford is certainly not the first car maker to do this - Jeep and Dodge did previously (if my memory serves me correctly). But I agree that it's a great idea. MUCH better than those pop-up ads that cover your entire site when you accidentally mouse over the wrong word or something. Annnooyyyiing! Plus, I think Doug is pretty funny - I've been watching his tweets and FB posts, and I like that Ford is letting him be what he is - a character. Thanks for the comment Melanie and pardon any confusion in my post. I didn't mean to imply Ford buying the ad placement was never done by an automaker. In fact, Ford Explorer, Fiesta, and Lincoln MKX have all bought this placement, as have other brands and possibly more Ford vehicles too. 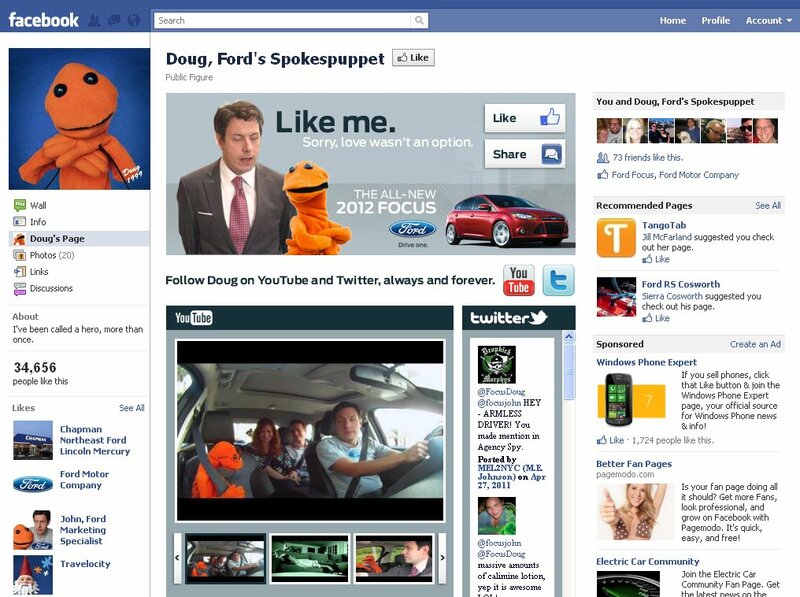 I meant driving all ad traffic to a Facebook fan page for a puppet is definitely a first. Actually, Ford has done it before - particularly with the reveal of the Ford Explorer on Facebook and across the web. Glad you like Doug! He's definitely different. I guess gimmicks are fine and all… but would rather have Ford focusing on the sportiness and fuel efficiency of the Focus. It’s a really good car… wouldn’t think they’d need a puppet to help sell it. Here is what is slick for the Yahoo Login Page. It isn't blocked by Firefox's Ad Blocker Plus. When Ford promoted the new Explorer I told Scott Monty I will never see their ad online. He said log into Yahoo. BAM! There it was. Sneaky. Curious how many log ins occurred to get the almost 35,000 likes. Now for my infamous Facebook Fail observation. Doug and I both like Travelocity. I didn't know I 'Liked' Travelocity on Facebook. See how much value my 'Like' of Travelocity has been for Travelocity!